This poster gives simple information about the Maiasaura dinosaur (featured in the film Jurassic Park) and how it lays eggs and cares for its young. 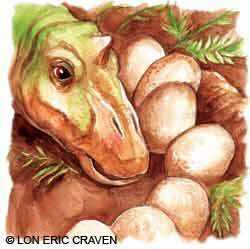 The nests of the Maiasaura were bowl shaped and were about 2m in diameter, 75cm deep, and 8-9m apart so the adults could get between them without stamping on them. The information in this poster is presented in a series of simple and compound sentences within a flow diagram, supported by illustrations. Children working at the beginning of Letters and Sounds Phase 5 should be able to decode the text, although they may need some support with some subject-specific vocabulary. Talk about birds, eggs and nests. Ask what the children already know about these things and the life cycle of birds. A real nest with egg shells would be a particularly helpful prop but, if not available, use pictures and models. Look at the size of different bird’s eggs – some can be quite large compared with the chicken or duck eggs with which the children are likely to be most familiar. Ask if the children know anything about how dinosaur babies were born. Explain that they also came out of eggs. Compare a Maiasaura egg to a grapefruit, for size.